While it could just be a rock, this bizarre-looking space object, as the first interstellar one ever observed in our solar system is causing quite the stir. 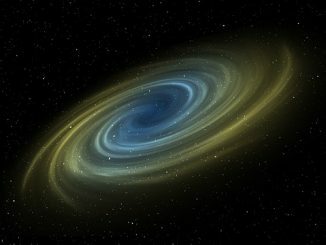 An international team of scientists including renowned English cosmologist Stephen Hawking are toying with the possibility that the first known interstellar asteroid, first spotted on Oct. 19 by astronomers at the Pan-STARRS project at the University of Hawaii, could be an alien probe sent by an advanced civilization elsewhere in the universe. The unusual object in question, named ‘Oumuamua, Hawaiian for ‘a messenger from afar arriving first‘, is a 1,312 feet long but only one tenth as wide, cigar-shaped looking rock that’s currently hurtling through space at almost 200,000 miles per hour. ‘Oumuamua was first thought by scientists to be a comet but since it had no fuzz, that possibility was quickly ruled out. Based on measurements of the object’s highly elongated and very narrow shape (most asteroids are round), and most intriguingly: its orbit, which clearly indicates that the fast-moving asteroid originated from beyond our solar system, the speculation is that ‘Oumuamua might actually be something else than what it appears. Hawking and his colleagues at Breakthrough Listen, a 10-year project created in 2015 with $100 million in funding from internet investor and Russian billionaire Yuri Milner are intrigued by this possibility. After meeting with theoretical physicist Avi Loeb, Listen, as an astronomical enterprise designed to search for evidence of intelligent alien civilizations beyond Earth announced that they will begin listening to ‘Oumuamua for electromagnetic signals that can’t be produced by natural space rock bodies. Today’s high tech-scanners require less than a minute to detect a cellphone-strength radio signal coming from the asteroid. If they pick up any evidence of otherworldly technology, it would be proof that aliens could be at play. Other astrophysicists like Dr. Jason Wright from Penn State University think that Oumuamua’s strange motions suggest it could be an alien spaceship with broken engines that is tumbling through our solar system. 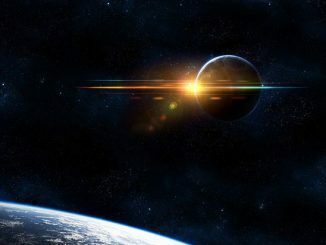 Dr Wright argues that the fast moving asteroid could be a ‘Von Neumann probe’ – a theoretical self-replicating spacecraft consisting of an interstellar propulsion system that involves visiting star systems and the penetration of remote regions of the Galaxy. Returning to Loeb, while acknowledging that the chances of detecting alien activity are very small, Harvard’s astronomy department chair suggests proceeding with caution in case a radio signal does indeed come back from the object. “My recommendation, as in any dialogue, is that we first listen and do our best to understand what we are hearing,” Loeb told the Daily Mail. “Once we figure this out, we can decide how to respond. Overall, I am an optimist. 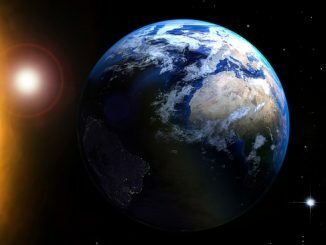 I believe that a very intelligent civilisation will be peaceful, and we could save ourselves millions or billions of years by learning from it. Breakthrough Listen said that if it picks up any evidence of possible artificial transmitters, it is fully prepared to let everyone know right away. “There’s no way to keep something like this a secret, because it requires us calling everyone we can,” Andrew Siemion, the director of the Berkeley SETI Research Center who leads its Breakthrough Listen Initiative explained in a statement. Listen began observing ‘Oumuamua using the Green Bank Telescope on December 13. So far, and based on the first round of radio observations, they have found no signs of artificial origin being transmitted from the famous asteroid. While the search isn’t over yet, it is possible that this may turn out to be nothing more than a space rock. 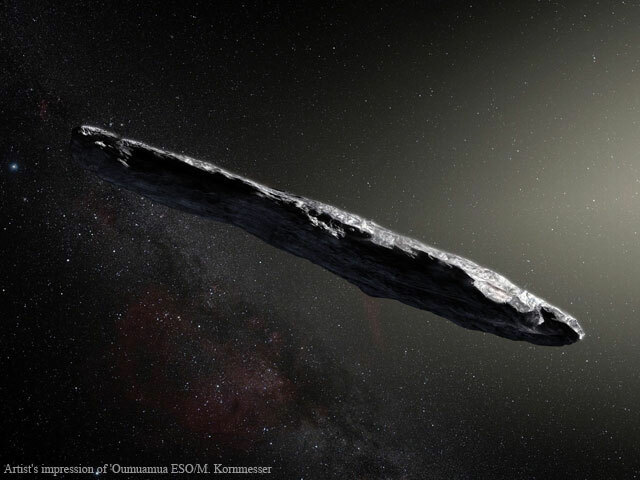 However, as scientists rush to study ‘Oumuamua before it heads back out into interstellar space, just the fact that the cigar-shaped interloper is the first observed object from outside our solar system is more than enough for us to feel excited. Are Aliens Behind These Mystery Radio Signals Coming from Distant Galaxy? Listen, learn and try and understand. Sure that’s what the current leader of the free world will do. God help us all if this is a probe. But maybe it’s actually here just to deliver us from the orange turd. The problem is how could something this elongated naturally occur. Oh, nonsense – it’s just a rock.